Last month the Neitzel family of Dallas, Texas discovered that their 6-year-old daughter Brooke had ordered a doll house on Amazon by simply saying “Alexa, can you play dollhouse with me and get me a dollhouse?” But that’s not all. When this story was picked up and reported on San Diego’s CW6 (stay classy, San Diego), CW6’s anchor Jim Patton said, on air, “I love the little girl saying ‘Alexa ordered me a dollhouse’,” triggering a legion of Amazon Echos in the San Diego area to attempt to order a dollhouse of their own. And, as if that weren’t enough, as an added bonus, Alexa threw in 4 pounds of sugar cookies for the Neitzel family. Now, the child had of course not meant to actually order a dollhouse (or had she?) but Alexa did not know that. 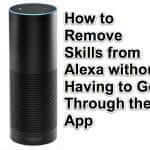 In fact, because the Amazon Echo has voice recognition, but not specific voice voice recognition, anybody’s voice can trigger the Echo, they just have to say the ‘wake word’ followed by a command that Alexa either recognizes or, as in the case above, can parse as an inferrable command. 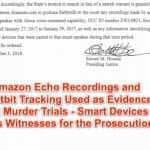 Another example of an Amazon Echo being triggered inadvertently was when a story on NPR radio accidentally set off listeners’ Echos, leading to hilarity, and heat, as at least one listener’s Echo turned up the heat on their Internet-connected thermostat. 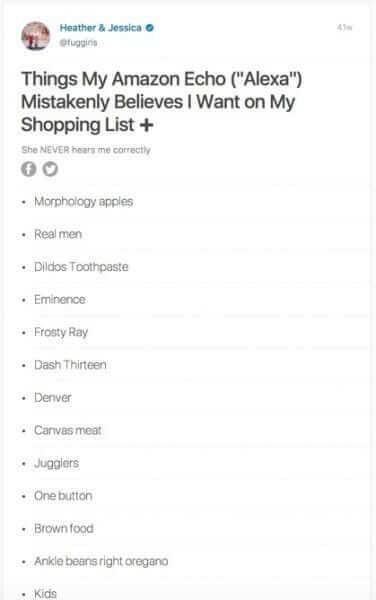 And then there are the shopping lists – oh, the Echo shopping lists. 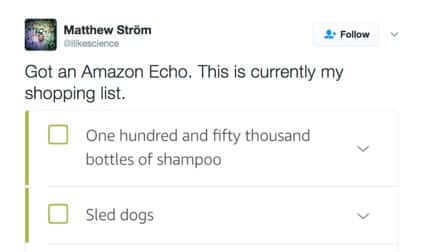 Alexa has added everything from sled dogs to unmentionables to users’ shopping lists as a result of her everlistening and overactive imagination. And as we know from our own experience, a friend can walk into your house, and if they know you have an Echo they can make it do just about anything, from playing music to ordering anything that Amazon stocks. 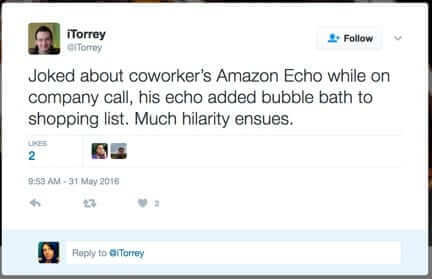 So, how do you keep your Echo on while at the same time thwarting unwanted orders, intentional or otherwise? Well, the first thing you can do is change the ‘wake word’ to one of the other three options: Echo, Amazon, or Computer. Of course, you will need to carefully consider which of the four wake word in total you are least likely to be saying with in ‘earshot’ of your Echo. The problem there is that the other three wake words are generally in even more common use than the term ‘Alexa’. 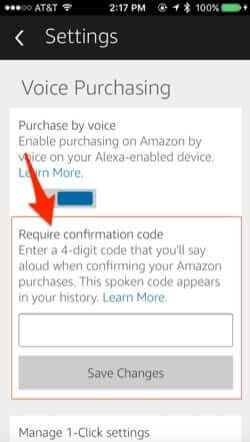 The other thing you can do is set up a code that you must speak to your Echo before it will actually place an order on your account. 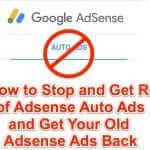 Here’s how to do that. 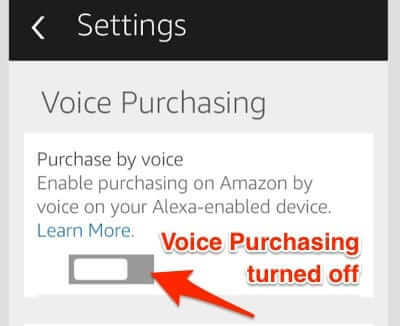 Open your Alexa app on your phone, and scroll all the way to the bottom, where you will see ‘Voice Purchasing’. 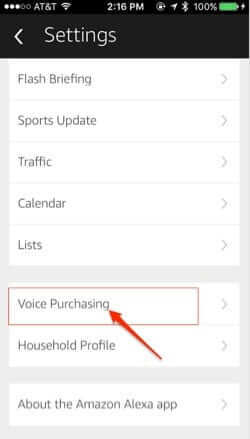 Select Voice Purchasing. 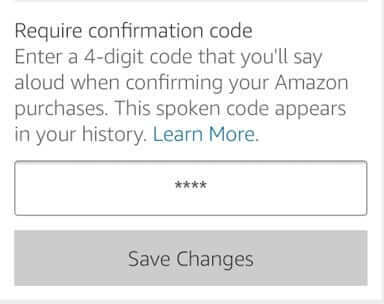 In the Voice Purchasing section you will find the option to create a 4-digit confirmation code. Enter whatever code you like, and then press on ‘Save Changes’. Now, whenever an order is placed through your Echo, you will have to speak that 4-digit code before the order is actually placed and charged to your account. But, what fun is that? Now, whether or not you code-protect voice purchases on your Echo, or turn voice purchasing off entirely, people will still be able to issue voice commands to your Echo such as “Play Who Let the Dogs Out” or “Turn up the heat”, but at least they won’t be able to order you a dollhouse. For their part, the Neitzel family has donated the dollhouse to a local charity. No word on what they did with the four pounds of sugar cookies. 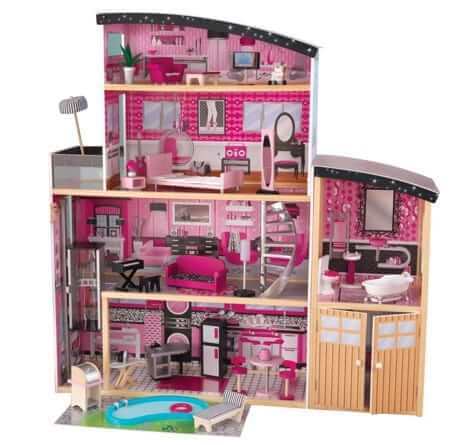 Last month the Neitzel family of Dallas, Texas discovered that their 6-year-old daughter Brooke had ordered a doll house on Amazon by simply saying "Alexa, can you play dollhouse with me and get me a dollhouse?" But that's not all. 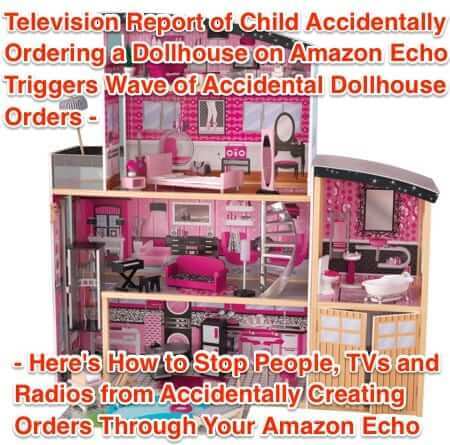 When this story was picked up and reported on San Diego's CW6 (stay classy, San Diego), CW6's anchor Jim Patton said, on air, "I love the little girl, saying 'Alexa ordered me a dollhouse'," triggering a legion of Amazon Echos in the San Diego area to attempt to order a dollhouse of their own.